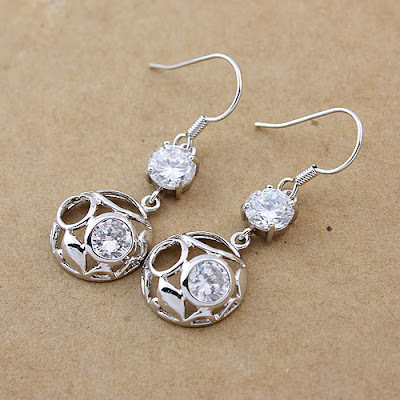 Since the prices of platinum and gold are very high there are many who have turned to buying sterling silver jewelry. Silver is the most white metal and the whiteness of silver even exceeds that of rhodium or platinum. This is the reason why a silver surface that is flat and polished resembles a perfect mirror. The only problem with silver is that it gets tarnished. This is because the molecules of silver on its surface combine with oxygen and the result is the formation of silver oxide that is blackish in color. This is a big contrast with the whitish appearance of silver. That is why when making a mirror; the silver is usually covered using glass. Glass is used to block oxygen and this prevents tarnishing. Since it is not possible to buy silver jewelry that is coated with glass, it will tarnish after some time. There is some silver jewelry that is plated using rhodium to prevent the tarnishing. This kind of silver should not be polished as this will remove the rhodium plating. Although rhodium is in the platinum group of metals, it does not have a whitish appearance as silver does, so it is at times an advantage to acquire silver jewelry that is in its natural state. When buying silver jewelry from a store, it is important to ask whether the piece is coated with rhodium so that it is clear about how it should be cleaned. There is some silver jewelry that does not need to be polished regularly because tarnishing is prevented by the skin oils and frequent washing. This means that jewelry that is worn close to the skin like a chain, a ring or cross tends to remain untarnished. The tarnishing only occurs when the jewelry is exposed to harsh chemicals that increase the rate of oxidation. A good illustration is when someone who is wearing a silver cross on the neck swims in a pool that has chlorinated water, the jewelry will quickly turn black. Swimming in a pool that draws water from a spring or a lake does not tarnish the sterling silver jewelry. Silver is highly reactive and it reacts when it gets into contact with oxygen, chlorine or sulfur.